The new data presented in June by Consumer Intelligence Research state that Apple's iPhone 5 sales account for 52% of the company's smartphone sales. 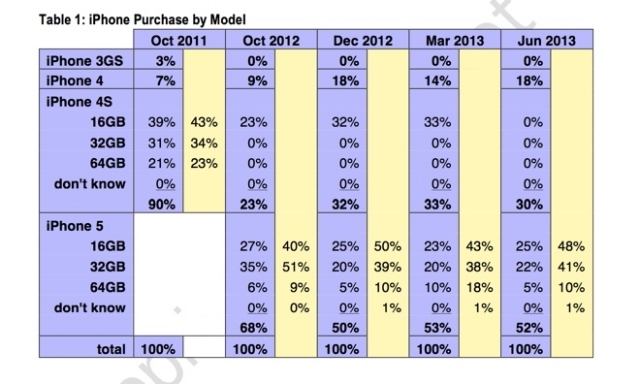 The figure of iPhone 4S corresponds to 30% of the sales while the one of iPhone 4 only reaches 18%. The sales Phone 5 seem to be occupying more than half of all iPhone sales, figures registered nine months after the launch of newcomer. Whereas the earlier model, iPhone 4S, accounts for almost three-quarters of iPhone sales nearly a year after its launch. Last but not the least, iPhone 4S had 90 percent of all iPhone sales in the immediate after-launch period , compared to about 70 percent for iPhone 5. According to the report, 44% of the iPhone purchases were from AT&T (the figure is 5% lower), 34% were from Verizon (a decrease of 5%), and Sprint (a 2% fall) . T-Mobile remains to account for 12% of sales. CIRP's data also discovered that more than half of iPhone buyers in June were upgrading from another platform (Android, Windows Phone, etc) or were buying their first smartphone.